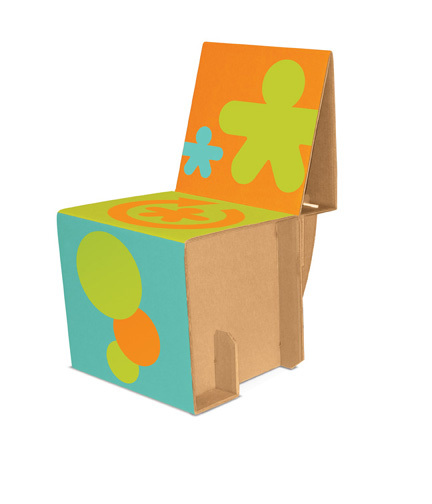 In anticipation of the launch of the Elia Mini Chair (a functional kid-size cardboard chair) happening at next week’s Free First Saturday “Escape to the Suburbs!”… yes, kids can customize one to take home! !… I talked with Michael Gross, Canadian architect/engineer and his wife Rey Tabarrok the creative duo behind this completely recyclable piece of modern furniture. Tell us the history behind the Elia Mini Chair. How did you come up with the concept? What inspired the name? MG: The genesis of the Elia Mini Chair was a studio project in my first year of architecture school that challenged us to design a sturdy, comfortable and good-looking chair using only cardboard. The arm chair that my partner Denis Gregoire and I designed was very well received and that got me interested in translating the project into a summer job. In 1994 I evolved some of the principles that Denis and I used in the arm-chair to create a more efficient dining chair. I actually manufactured and sold about 500 of the dining chairs before returning to architecture school for my final thesis year. Even though the chair served as a dining chair and desk chair in our own home for the many years that followed, it was only after persistent interest and encouragement from friends and my wife Rey, that I revisited the idea with the eye to manufacture it again. I think the world is obviously more concerned about sustainability now and definitely, or should I say hopefully, more receptive to cardboard as consumer product. I also think I have a fresh perspective now that I am a parent. RT: This (parenthood) is definitely the most important element that informed our approach to creating a kid’s product. We were inspired by, and therefore named the brand after, Elia our crafty 6 year old daughter. Not only were we aiming to produce a product that was interesting and engaging, but also one that expressed our sense of responsibility towards our environment, which we try and impart to our daughter all the time. All of this, plus, it had to jive with Michael’s design and aesthetic sensibility. RT: I agree. We are (for the most part) on the same page on the ‘less is more’ approach, both in terms of design, and certainly in our philosophy on consumption. But we digress…. MG: Our decision to launch a kid’s version of the chair also addresses our belief that there are few options out there that encourage creative interaction between kids and their parents, that exercises the artistic vision of the child, and are, at the end of it all, functional. RT: …..and a good looking piece of modern furniture that is not an eye-sore. Add to that the fact that it does not contain lead, is manufactured locally, and is completely recyclable, and you have an overall feel-good experience. Which is, incidentally, why we felt that the Walker was a natural place for the launch of this product….art, modern, and social responsibility and making it all accessible through the Free First Saturday events which we’ve been great fans of and avid participants in over the years…..
Every member of your family has contributed to the development of the Elia Chair in one way or another. Can you talk a little about the role each of you has played? MG: By now, you’ve guessed that my wife and partner Rey, has not only been a great supporter of the chair and my chair-leader (chuckles) over the years, but she also brought her great experience in marketing and advertising to the development of the concept and the brand. RT: My biggest contribution is my perspective as a mom and as a consumer of all things crafty. I have engaged in (bought) so many craft and activity kits over the years, I know what I love in a craft project, and what is a source of frustration for both my child and me, not to mention waste…Elia obviously has been the inspiration for the brand and has actually been a very good critic during the creation of the art of the package. Out of curiosity, do you often work on creative projects as a family unit? If so, can you share a favorite memory? MG: We work together often, whether it is building stuff with Legos, making all kinds of variations of beaded bracelets and necklaces. Elia and I spent a good deal of time in our front yard last weekend making a snow monster with what was probably the best packing snow of the year. RT: I can vouch for Michael’s amazing patience and enthusiasm in beading. Both Elia and Michael are also into pottery. My creative juices are exercised in finding the right place to display (or not!) the end result of these creative outputs. The Elia Mini Chair is not only super fun to assemble and customize with your own look, but it also seems like there’s a built in learning lesson about sustainability, design principles (marriage of form and function), etc. What do you want families to get from their Elia Chair? MG: The fact that cardboard is ubiquitous in consumer culture and is the most recycled of all consumer products makes it a great vehicle for helping kids understand issues about sustainability and the environment. I think corrugated cardboard is a really brilliant invention. It was developed as a less expensive and lighter alternative to wood and plywood as a packaging material at the end of the 19th century. It has enormous structural strength given its light weight and this, of course, is a result of the way it is made – layers of fluted liner (paper) sandwiched between flat liner. The flutes are like roman arches in that that they resist compression and transfer load efficiently. Cardboard also behaves like a structural column when it is edge-loaded. So the Elia Mini Chair is also a great way to teach young kids about basic engineering and geometric principles like the arch, the triangle, compression, tension, beams and columns. And hopefully children will come away with an understanding that good design is a marriage of art and engineering. Sustainability is definitely the buzz word when it comes to contemporary design and architecture. Are there any designers in the field that have inspired you? Any other cardboard furniture makers that you admire? Frank Gehry’s cardboard furniture is really beautiful and sculptural. I also really admire the De Stijl cabinet maker and architect Gerrit Rietveld’s work. Of all contemporary architects, I think I am most inspired by Shigeru Ban. His novel use of materials (including cardboard and paper), his sensitivity to the environment and his social activism make him one of the most important, and increasingly influential, architects. Quite often, well-designed modern-looking furniture is accompanied by a big price tag. 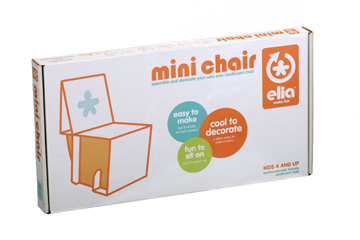 What I love most about the Elia Mini Chair is that it’s super affordable, retailing at $29.99. And the kit includes six 12″x12″ custom color stickers to decorate the chair with so it is an incredible value. The Elia Mini Chair kits are available at the Walker Shop, at Creative Kidstuff stores, and at www.eliafun.com, and this Saturday at Free First Saturday they’ll be free while quantities last.. Michael and Rey have kindly donated several hundred Elia Chairs for local families to decorate and take home with them. Please no pushing. Ed note: The chair is now available in the Walker shop and the link has been updated.